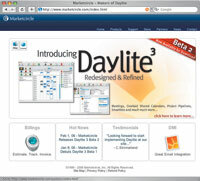 DayLite 1.8 by Marketcircle, Inc.
DayLite has some nice features including easy-to-sync data sharing over the Internet or LAN, a split-screen project manager that puts most of your key data right in front of you for easy access, plus email integration with Mac OS X Mail (a $39 option). Keyword accessibility and linked contact information lets you address each project with the personal information that can make the difference when you need to impress a client or just to stay more on top of your tasks at hand. One of my favorite features in DayLite is the ability to cross-reference your data so that you can see the potential for important timeline data or coincidental events that could make or break a project’s success. It may be too well thought out, though: The scope of what DayLite offers is tremendous and those of us who are more inclined to be right-brained creative-types may feel overwhelmed by this product. Using DayLite is just a matter of putting in the time to learn the application. It’s intuitive and only requires time to understand the icons, shortcuts, and methods used to make it all come together for you (maybe easier said than done).